Carus’s devotion to the music of Andreas Hammerschmidt is one of the most encouraging features of their ever-expanding catalogue of recent recordings. Sometimes they have conjoined his music with that of an eminent contemporary, as they do here: Johann Rosenmüller. A previous disc was called Machet die Tore weit [83.375] and this latest release is no less successful. 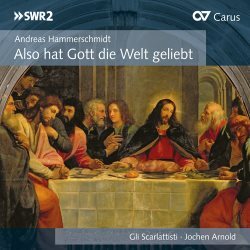 It was the 400th anniversary of the birth of Hammerschmidt in 1611 or 1612 – Carus had two years in which to cover the ground – that was partly the stimulus for such re-evaluation on disc of his music. It was appropriate then to call the disc after the title of one of his best-known works, Also hat Gott die Welt geliebt, a late six-part motet (it’s not the four-part cantata of the same name). It’s formally well laid-out but irradiated by interesting metrical and especially textual detail, such as the echo effects and the verbal emphases which attest to the composer’s close immersion in textual detail and, more importantly, meaning (a section of the Gospel according to John). Herzlich lieb hab ich dich is a much earlier work, written when Hammerschmidt was in his very early thirties. It’s cast for two tenors and much is made of syncopated figures as well as musical plummets which are deeply elegiac in their application. These musical and textual subtleties show how pieces even as relatively succinct as these can be given a deal of weight and significance out of all proportion to their ostensible size. The festive and fanfare element of his musical self is explicit in Jauchzet dem Herren. A setting of Psalm 100 (‘Make a joyful noise unto the Lord’) the small accompanying ensemble manages to generate exemplary dance rhythms in support of the overriding textual message. The programming cleverly follows this with Lobe den Herren, meine Seele, a setting asking for the liberation of forgiveness. This cleverness continues throughout the settings – an expressive Passion setting followed by an Easter dialogue, a little concerto with its own short five-part sinfonia (Schmücket das Fest mit Maien), soprano duet and choral flourish. There is terrific variety in these settings, and the accompanying forces and continuo instruments are equally varied too throughout them. The companion work by Rosenmüller is his Dixit Dominus, a Psalm cantata, vivid, colourful, dramatically textured in places, and offering good opportunities for the solo soprano in particular. Instrumentation here, too, is varied and changeable, and Rosenmüller doesn’t forget to unveil a fugal incident. Jochen Arnold marshals the forces of Gli Scarlattisti with assurance. Note, should it matter, that the two composers’ works were recorded a decade apart, according to the booklet notes, the Rosenmüller in 2001 and the Hammerschmidt a decade later, but in the same location, the Church of St Peter and Paul, Stuttgart.